Parkinson's Disease - body, contagious, causes, What Is Parkinsons Disease? Parkinson's disease is a disorder of the central nervous system that causes shaking, rigid muscles, slow movements, and poor balance. The disease is progressive, meaning it tends to get worse over time. Actor Michael J. Fox first noticed the twitch in his left little finger in 1991 while filming the movie Doc Hollywood. He remembers looking at the shaking finger and thinking, "Geez, what's that?" Within 6 months, his whole left hand started to twitch uncontrollably, and parts of his body started to feel stiff. Fox was concerned, so he visited a doctor. Fox was only 30 years old and appeared to be in excellent health. His roles often required physical stunts that he performed with ease. So Fox never expected to be told his shaking hand and rigid muscles meant he had Parkinson's disease, a condition that is more common among people over age 50. Parkinson's disease is a movement disorder. It results from chemical imbalances in a small area deep within the middle of the brain that controls muscle movements, coordination, and balance. The disease often is first noticed when a finger or hand starts to twitch involuntarily. The person might seem to be rolling a small ball between his fingers; a twitching motion doctors call "pill-rolling." The shaking often is barely noticeable to other people. Slowly over months and years, the twitching gets worse. Sometimes, it affects only one part or side of the body. Although it often starts in a limb, the tremors can affect the neck, face, and head. Muscles also become rigid and do not respond normally. The brain is lacking the ability to send the proper messages through the central nervous system to get the body to act the way a person wants. At times, the person seems to freeze in the middle of an action, such as reaching for a book or walking. The person starts to shuffle his feet and walk slowly. The arms do not swing back and forth normally. It can become difficult to sit or walk without rolling forward and sometimes falling. As talking becomes difficult, the person speaks slowly and in a monotone. Eventually, the symptoms become so severe the person needs help with simple activities of living, such as walking and eating. The person's ability to think also can be affected late in the disease. Not all people develop all the symptoms. Sometimes the disease progresses quickly, from the slight tremors to incapacity within a few years. Often, however, especially with treatment, a person can live well for many years. The disease affects more than 1 million Americans. About 10 percent of the cases involve people younger than age 40, like Fox. Most men and women who get the disease first show signs between ages 50 and 75. The disease is named for a British doctor, James Parkinson, who first described the disease's symptoms in 1817. He called it "Shaking Palsy." In the 1960s, scientists began to understand how the chemical changes in the brain caused the symptoms. Eventually, research led to medications and other treatments to help control the disease. People with Parkinson's lack enough of the chemical dopamine in their brain. Dopamine (DO-pa-meen) is a neurotransmitter, which is a chemical that helps nerve cells send messages to each other. Dopamine receives assistance in sending these messages from other chemicals. For some reason, the production of dopamine and the other chemicals is disturbed in the brains of people with Parkinson's. When that happens, the messages cannot be delivered as well between one nerve cell and the next. Shaking, rigid muscles and other problems result. No one yet knows exactly what causes the chemical imbalances. Scientists suspect there are a number of possible causes that may, in some cases, trigger the disease, such as a head injury (especially head injuries like those received during a boxing match), some medicines given for other serious conditions, abuse of certain drugs, exposure to toxic levels of carbon monoxide and other pollutants, and small strokes in the brain. Parkinson's disease is not contagious and therefore cannot be passed from one person to another, like a cold. The disease does run in some families, which has led researchers to search for a gene that might trigger the disease. Two large European families with many Parkinson's cases appear to share a defective gene, but the abnormal gene has not been found yet in many others with the disease. Parkinson's is a difficult disease to diagnose. There is no single test to determine if a person has it. Often, doctors rule out other causes of the shaking, such as a brain tumor or other brain disorder. Actor Michael J. Fox is not the only famous person with Parkinson's disease who has continued to maintain an active life. Janet Reno, the U.S. Attorney General during President Bill Clinton's administration, also has the disease, as do the Rev. Billy Graham and singer Johnny Cash. The boxer Muhammad Ali, who has the disease, created a dramatic moment atthe 1996 Olympics when he carried the torch in Atlanta. In 1998, Ali joined others in promoting more research that involves people of African, Hispanic, and Asian ancestry. 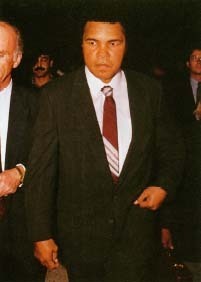 Former world champion heavyweight boxer Muhammad Ali, who has Parkinson's disease. There is hope for people with Parkinson's, because several prescription drugs can help. Most people are treated with a combination of drugs that help the brain make dopamine, the chemical needed to help nerve cells communicate in the brain. Other medications act like dopamine in the brain, improving the ability of the brain to control movements. The drugs do not cure the disease, but they treat its symptoms. People are able to do many of the same things they did before the disease developed, which is why Michael J. Fox has been able to continue working. Fox, however, also had brain surgery to destroy tiny areas of his brain that were malfunctioning. By eliminating these cells, the trembling in some people with Parkinson's can be improved. There are experimental treatments, including transplanting brain tissue from human fetuses into the part of the brain where the dopamine is in short supply. Early results show that this might benefit some people. Because the tissue often becomes available after an abortion, the technique is controversial. Researchers are experimenting with animal cells and cells they grow in the laboratory in attempts to achieve the same results as using fetal cells. Parkinson's disease was first identified and named paralysis agitans (pa-RAL-i-sis AJ-i-tans) by the British physician James Parkinson (1755—1824). His classic description of its symptoms was described in "Essay on the Shaking Palsy." Tremors like those characteristic of Parkinson's had been noted by physicians as ancient as Galen (A.D. 138-201) and by Parkinson's contemporary Gerard van Swieton (1700-1772). Parkinson's observations of the disorder, however, were among the earliest to interpret those symptoms as a well-defined clinical syndrome. Not long after Parkinson's essay was published, the French neurologist Jean-Martin Charcot (1825—1893) began using the term "Parkinson's disease" to describe the condition. American Parkinson's Disease Association (ADPA), 1250 Hylan Blvd., Suite 4B, Staten Island, NY 10305, (800) 223-2732. This leading support organization posts pertinent information on its website. National Institute of Neurological Disorders and Stroke, Office of Communications and Public Liaison, P.O. Box 580, Bethesda, MD 20824. A U.S. government research center. Offers free publication "Parkinson's Disease: Hope Through Research" by mail or on the Internet.